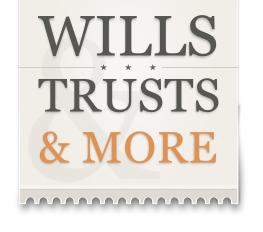 Wills, Trusts & More is not just a name, it's a reflection of the service we offer. Yes, we write wills and advise on and set up Family Protection Trusts, but we offer so much more, not just in terms of services - which cover a wide range including Power Of Attorney, Probate etc - but in terms of our care and promise to you. We visit our clients in their own home, believe in explaining their options in 'plain English' as opposed to complicated legal jargon and endeavour to find the right course of action for each individual.